Value of 30 Din. 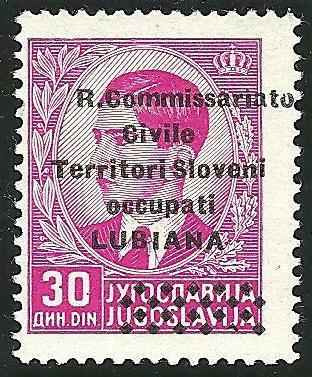 with overprint "R. Commissariato" (first line of overprint) shifted to the right - 39th position in the sheet of 100 stamps. An extraordinary stamp, MNH in very good quality, Sass. € 1.400,00 ++ (as hinged !). J. Bar was assuming 35 stamps were issued. According my research conducted during last few years I believe fewer stamps were overprinted.